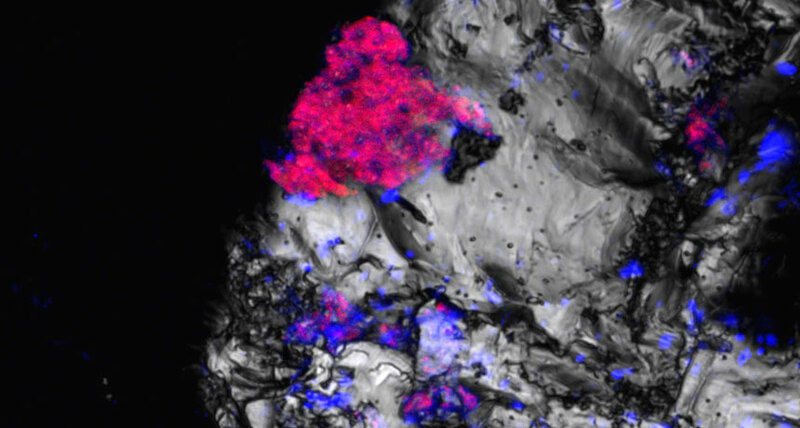 WHAT LURKS BENEATH This fluorescence micrograph shows traces of cyanobacteria (pink and blue), which typically need sunlight to survive, on a mineral collected more than 600 meters underground. Deep below Earth’s surface, life finds a way. Traces of cyanobacteria have been found more than 600 meters underground in a rocky outcrop in Spain, suggesting the microbes can survive without sunlight. Instead of photosynthesizing like others of their kind, these light-starved microorganisms may create energy using hydrogen, researchers report October 1 in the Proceedings of the National Academy of Sciences. Scientists initially were drilling for other types of bacteria deep below ground, says study coauthor Fernando Puente-Sánchez, a geomicrobiologist at the National Center for Biotechnology in Madrid. When the team discovered the cyanobacteria, it was “unexpected, counterintuitive,” he says. Cyanobacteria helped create the air we breathe today, first belching oxygen into the atmosphere over 3.2 billion years ago. Since the microbes’ metabolism typically depends on photosynthesis, they’re usually found where they have access to the sun’s rays. The researchers identified the cyanobacteria using a fluorescent dye that attaches to the microbes’ RNA. Because this fragile genetic material quickly degrades after the organism dies, scientists realized that the cyanobacteria must currently thrive in underground microbial communities despite the lack of sunlight. Puente-Sánchez and his team also ran tests to ensure their samples weren’t contaminated by drilling fluid, lab equipment or even microbes that live in and on the researchers themselves. The microbes need two things to survive in these harsh conditions, the researchers hypothesize: hydrogen gas and an oxidizing agent like nitric oxide, which acts as an on-off switch for the reaction that would allow cyanobacteria to feed on hydrogen. In the samples that contained the cyanobacteria’s genetic material, hydrogen was scarce, which suggests the microbes do feed on the gas. Other subsurface microbes are known to feed on hydrogen, since nutrients can be rare in that environment. “If there is energy that life can exploit, life does do that,” says Tina Treude, a marine geomicrobiologist at UCLA who was not involved in the study. She hopes the find will encourage other researchers to reevaluate previous studies which also have hinted at the presence of subsurface cyanobacteria. Scientists have long theorized what life might look like and where it might lurk on other planets. “With these kinds of discoveries that push our understanding of metabolism forward, you always open up a new box of questions,” Treude says.